This is a sponsored post written by me on behalf of At Home. All favorable opinions of this awesome Holiday décor destination are 100% mine. Hi sweet Friends! 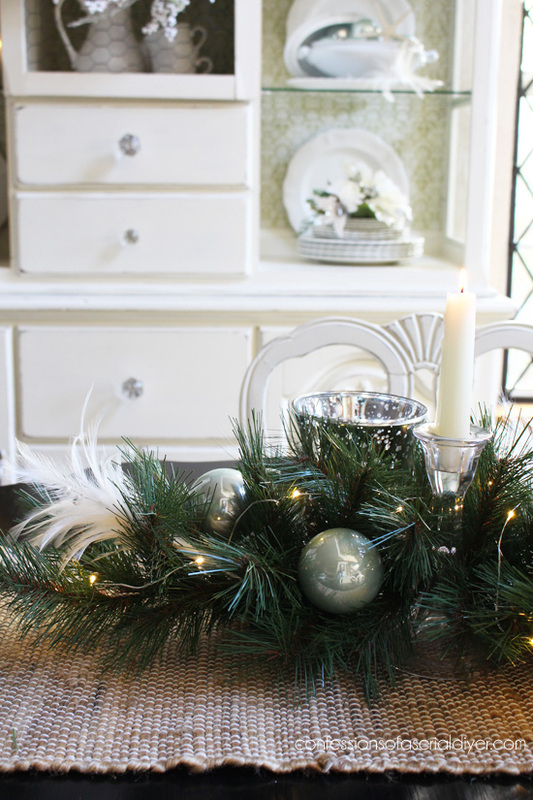 Today I’m sharing some of my Christmas décor. 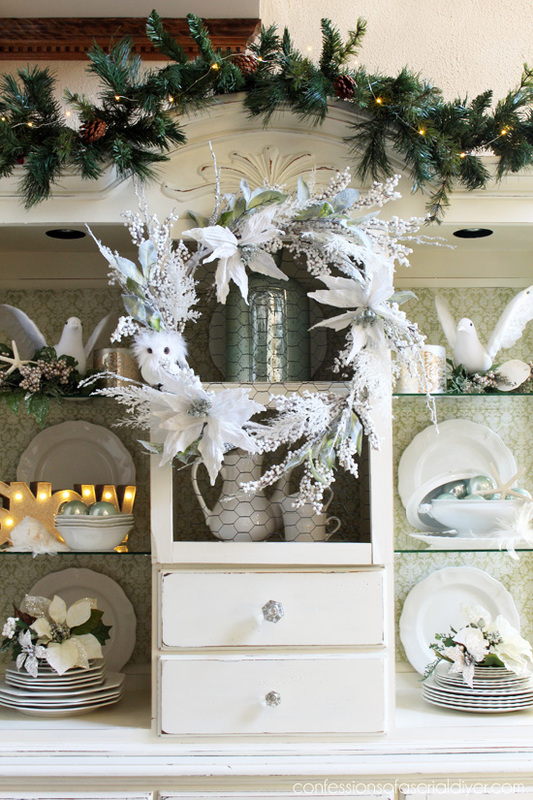 You’ve seen my dining hutch changed up a few ways this year, so when I had the opportunity to work with At Home and At Home Christmas Decor, I knew I wanted to give my hutch a fresh new look! 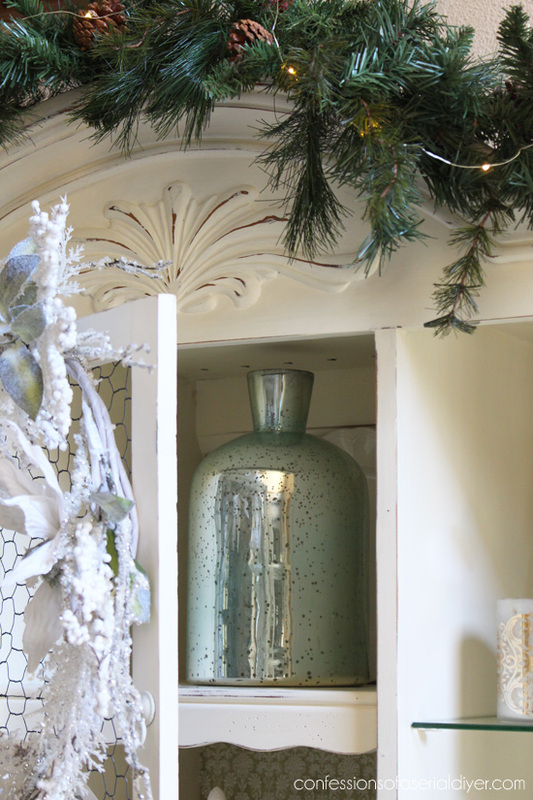 Have you visited an At Home store at the Holidays? They have SO MUCH to choose from! 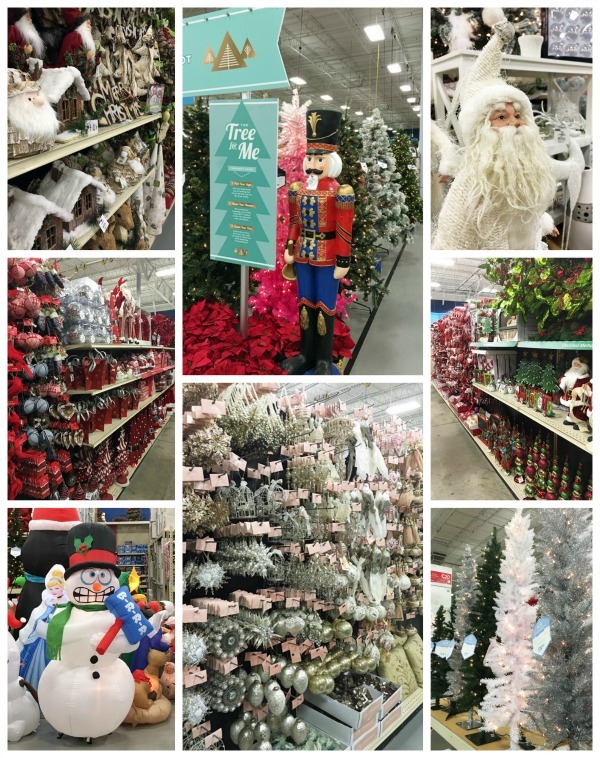 Aisles and aisles of Christmas Decor broken down by themes, and they have a huge selection of outdoor décor as well. At Home isn’t just for Christmas though, I found that pretty candle holder with their everyday items amongst a ton more candle holders. 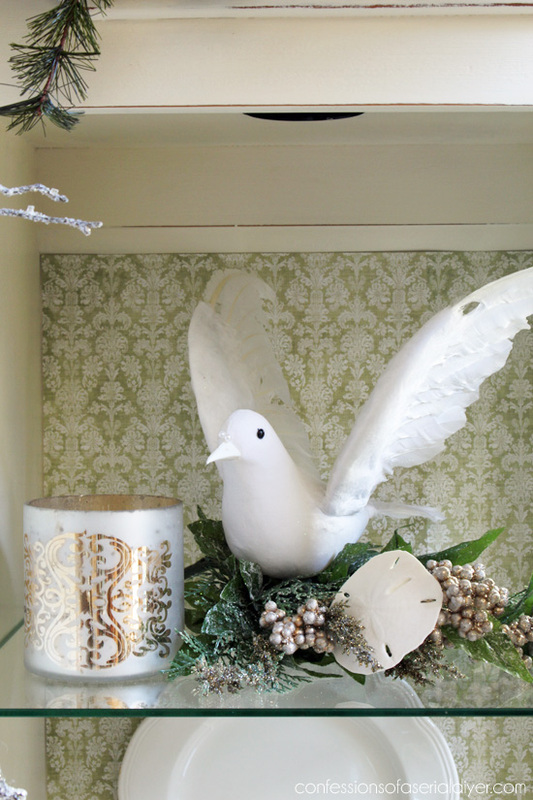 They are seriously a one-stop-shop for decorating your whole house. I found tons of items to decorate every room. They are the perfect inexpensive and festive addition to my thrifted iron stone. 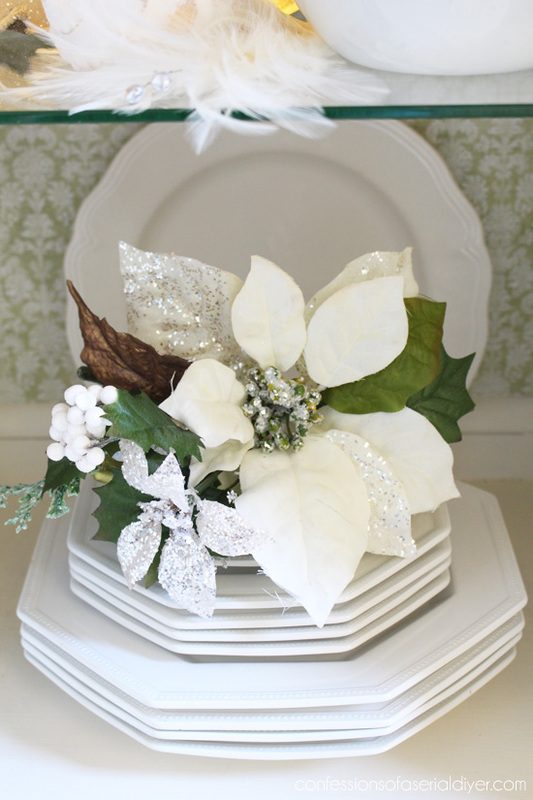 You could use them atop a stack of books, or add to packages to really dress them up. It runs on batteries, and I love how it glows at night. With her sweater and furry boots, I just had to find a place for her. Any of them sound perfect for you? Their Tree for Me Lot has over 100 varieties of artificial Christmas Trees, and all but one are exclusive to At Home. I’ve got my eye on that gorgeous snow-flocked one! Did I mention they have outdoor items as well? Anyone got a place for this Santa?? 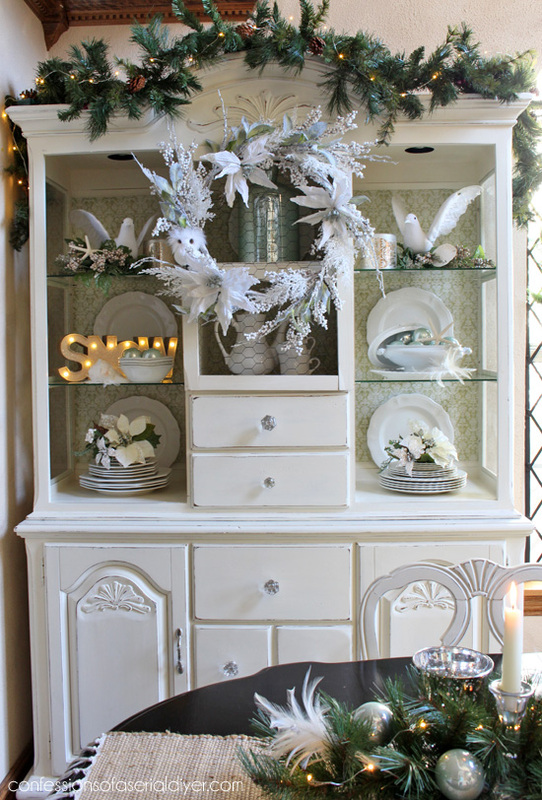 I really had fun working with At Home to give my hutch a whole new look this season. And of course if you know me, you know I’m cheap, and I was impressed with how great their prices were. Have you started decorating yet? This is the first time I can ever remember starting my decorating before Thanksgiving. I’m still tweaking a few things here and there, but I’ll be back soon to share more! I love how you decorated it. I have told my Hubby recently I want to start collecting owls and I adore the one you have on the hutch. So cute. I luv At Home, too. I found it when it was called Garden Ridge and we bought our Christmas tree there about 4 years ago and still love it. I try to limit my trips there as it’s very hard to control myself, with all the great things they have. I hope you have more restraint then i do. I have never heard of At Home and now I want to go. I know that you and your mom had fun shopping there! 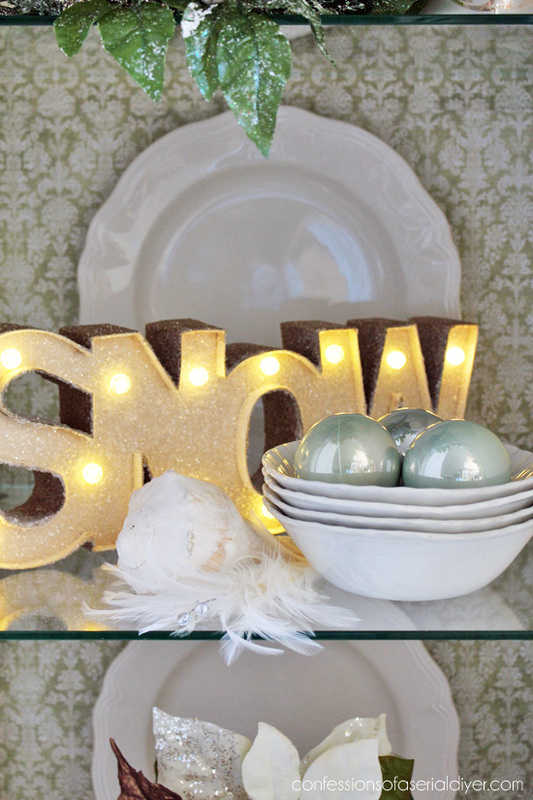 Christy, your hutch is just gorgeous so festive and I love the snow sign. I think I should stay away from there, but I think I need to search them out, I have never heard of them before, just my kind of place. That store would be “perfect” for me. Except there is none in Ontario. 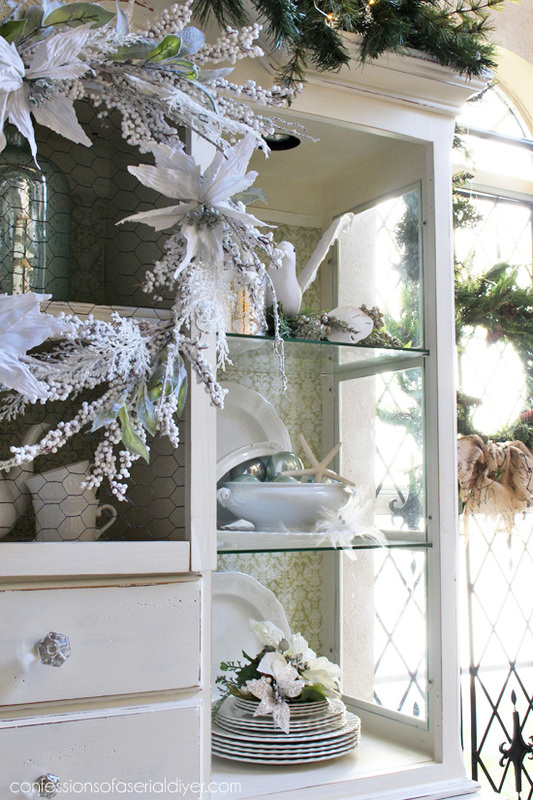 Love your choices to decorate your hutch.So festive. 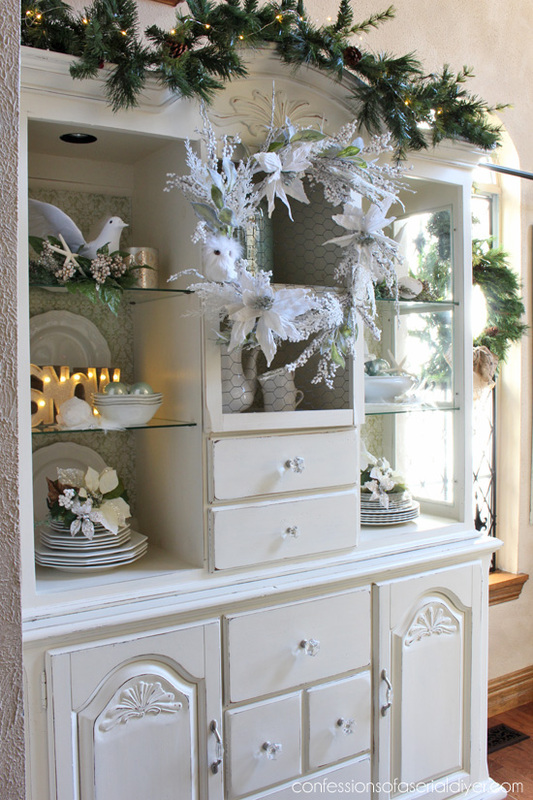 Your hutch looks fabulous for Christmas. I think I have found my new favorite store! I could be in there ALL day. Thanks for your inspiration. You are so talented. I love white iron stone. 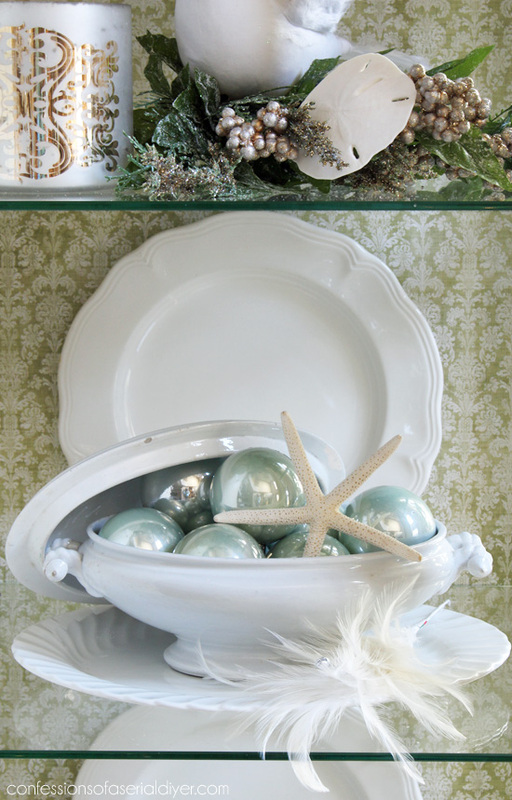 Adding those ornaments is souch an elegant touch. I likey! Your hutch looks so pretty Christy! I love all of the items that you chose! We just got an At Home in my town and now I’m going to have to go check it out! I’m waiting until after this weekend to start on my Christmas decorating. I’m sure your house will look gorgeous. I do a lot of icy wintry scenes because I love that look and since we don’t get snow here, I have to have the faux stuff inside to enjoy! I bought a few new pieces to add to that collection including more trees and an adorable deer. Have a wonderful & Happy Thanksgiving & a Merry Christmas! I noticed that your hutch is obviously white and very pretty. My question to you is this, my dining room table and chairs are antique and they are stained. My husband refinished the top of the table and it’s beautiful. He would never use chalk paint on it and some pieces are so gorgeous in their original color but I’m wondering if you can mix and match? I have an antique chest that I would like to chalk paint. I’m thinking of doing it either in the cottage white or aqua. Would that look okay? My hutch was a dated pine piece from the 90’s so I couldn’t wait to slap some paint on that thing, but I can definitely understand why you wouldn’t want to paint your beautiful table and chairs. I certainly think its okay to add a pretty painted piece in the mix though, especially if it will be a neutral color. It will add some light to the space. I say go for it! ? 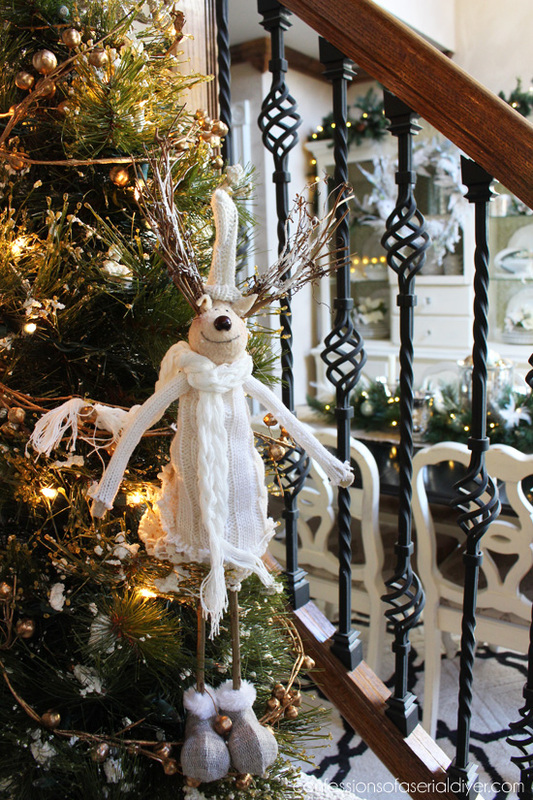 And that reindeer!! Where did you get her? 😀 She made me happy just looking at it!! Wishing you and yours a Very Merry Christmas and a Happy, Healthy New Year filled with Much Love and Laughter!! 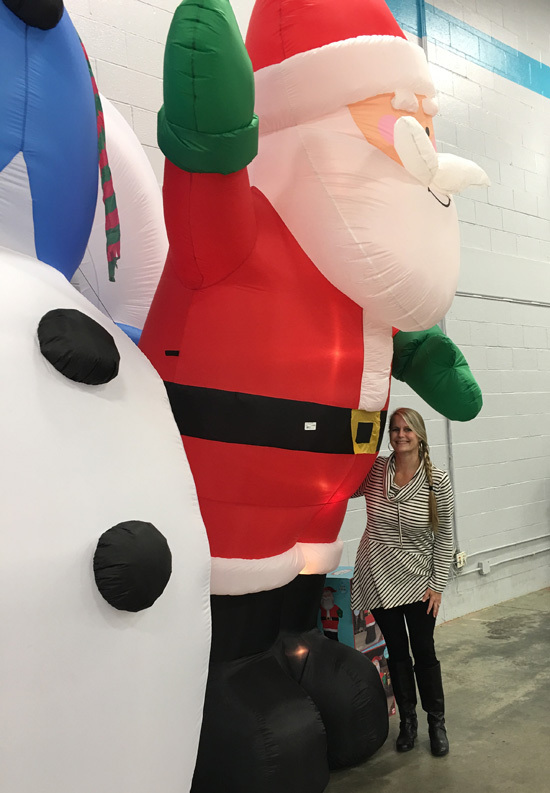 Cute photo of you and the giant Santa! I “hit up” AT HOME every time we make a trip to Charleston, SC. 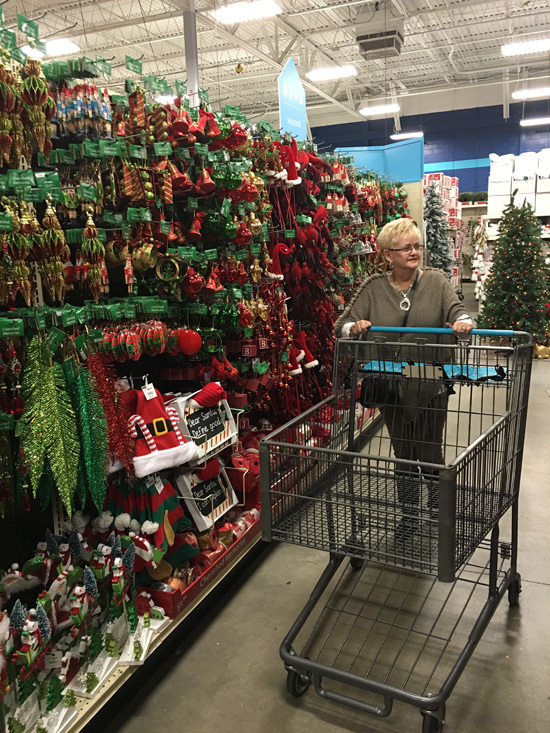 It’s located right off the interstate and I purchased some of my Christmas decor there, too! 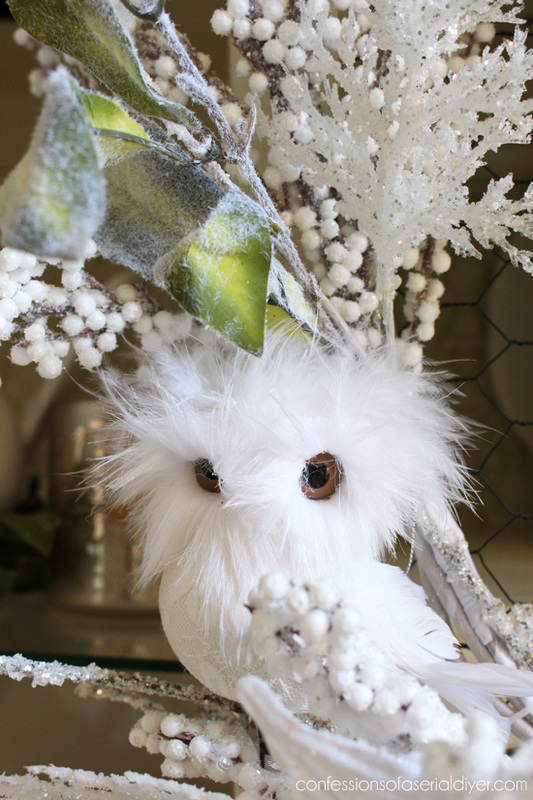 I’m in love with your snowy owl, the cute reindeer, and the lighted SNOW sign. 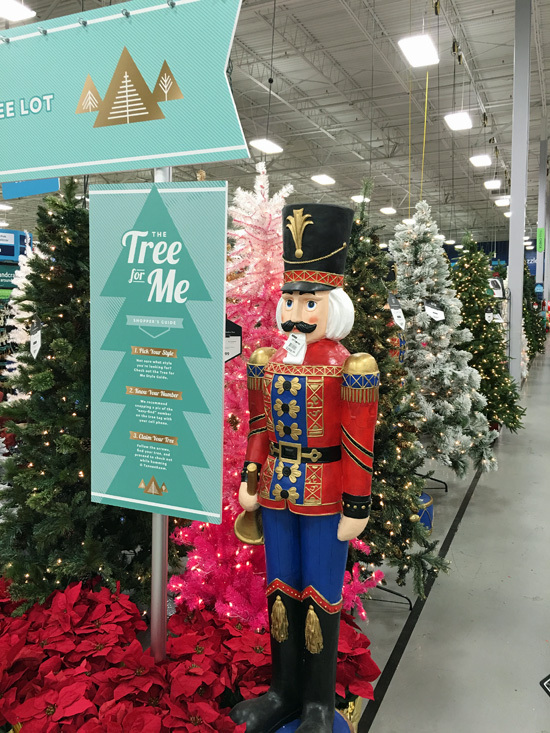 I just love how the store has everything organized by color and theme, and I saw some items in the Holiday Hoedown section that I really liked! Very pretty, Christy! What a wonderful job you’ve done with your hutch. 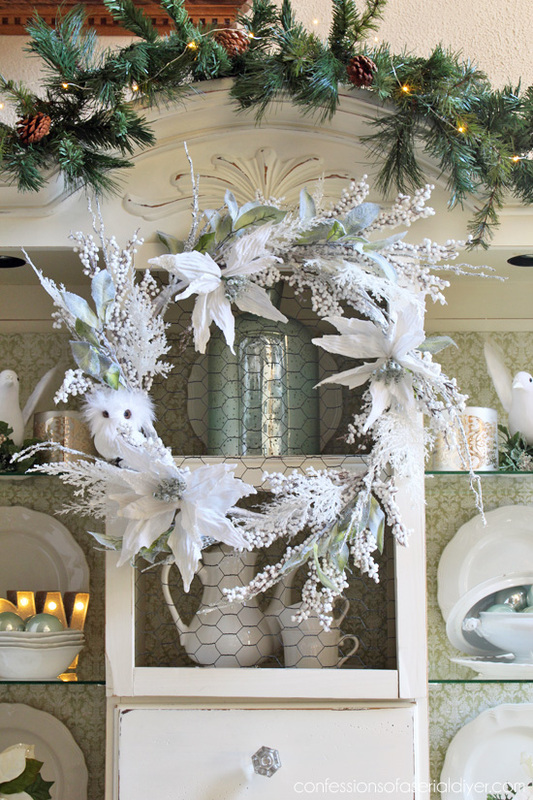 I especially love the little owl you added to the wreath and the doves. Your hutch is gorgeous! I love the little owl – so adorable! Love that candle holder with the gold embalishments! It’s so stylish and perfect for the holidays. You’ve done amazing job decorating your home. Enjoy the holidays!